French food doesn’t have to be intimidating or confusing, and you’ll find that some of the regional dishes are too good to pass up. 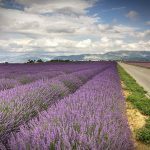 Whether you’re looking for French comfort food, an appetizer, or dessert, here are 10 regional specialties to try when you’re in France. 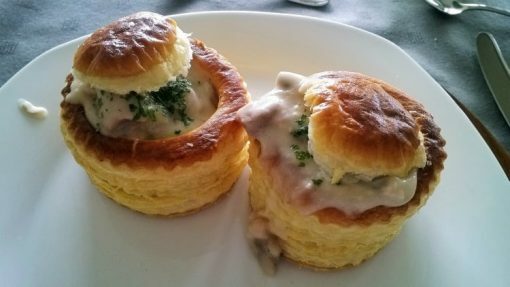 Bouchées à la Reine are bite-sized vol-au-vents, hollow puff pastries often filled with a chicken, mushroom and béchamel sauce. 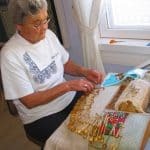 This culinary treat dates back to Marie Leczinska, wife of King Louis XV. Marie and King Louis had ten children together, but Louis was a notorious philanderer. To entice the King, Marie asked his chef to create an ‘aphrodisiacal’ savory treat. It may not have succeeded in taming the amorous King Louis, but it has stood the test of time and remains a French classic. Where to eat it: Patisserie Stohrer (51 rue Montorgueil, 2nd Arrondissement, 75002) in Paris. 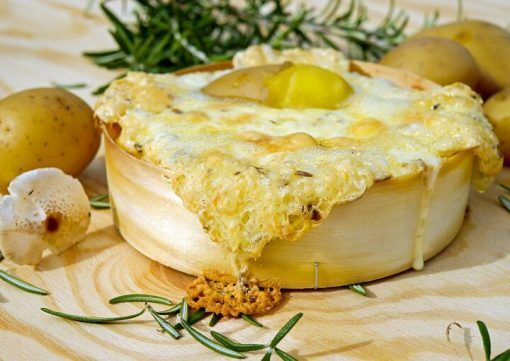 This typical cheesy dish from the northwestern region of Normandy, which translates as ‘Camembert in its box’, is popular with adults and children alike. The camembert is bought in its box, removed from its wrapper and cooked in the (water-soaked) box over a barbecue or campfire, or in the oven for 10 minutes. The melted cheese is delicious served with endives, crusty bread or apple slices. Where to eat it: This is a typical home-cooked dish, perfect for self-catering accommodation or to request if you’re staying with locals at their home in Normandy. The eponymous omelet is a specialty of La Mère Poulard restaurant and hotel on Mont Saint-Michel, a large inhabited rock about half a mile off the coast of Normandy in north-western France. The restaurant dates back to 1879, and this simple dish was developed to cater for the appetites of the large numbers of pilgrims to Mont St Michel Abbey. The egg whites and yolks are beaten separately and then cooked at a high heat, creating a kind of souffléd omelet. At the restaurant today, drummers in traditional costume put on quite a spectacle as they rhythmically whip the eggs with a long whisk in large copper mixing bowls. The restaurant is a bit of a tourist trap, which won’t be to everyone’s taste. This is a dish to try in the Loire Valley. 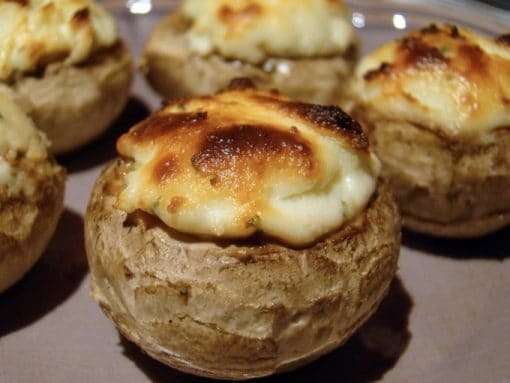 Les Galipettes Farcies are stuffed mushrooms and are often stuffed with goat’s cheese, sausage, snail or salmon with mixed herbs before being cooked in the oven. Galipettes with goat’s cheese are great as a starter dish and for vegetarians. Where to eat it: Le Saut aux Loups (81 Avenue de la Loire, 49730 Montsoreau) located right outside the mushroom caves in Montsoreau. Poule au Pot translates as ‘chicken in the pot’ and is similar to a chicken casserole. 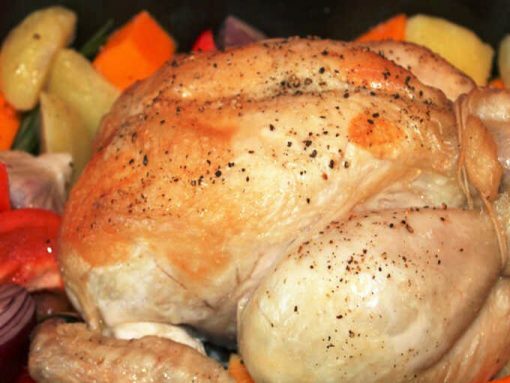 Normally a whole chicken is boiled in a pot with potatoes and vegetables for about 90 minutes. 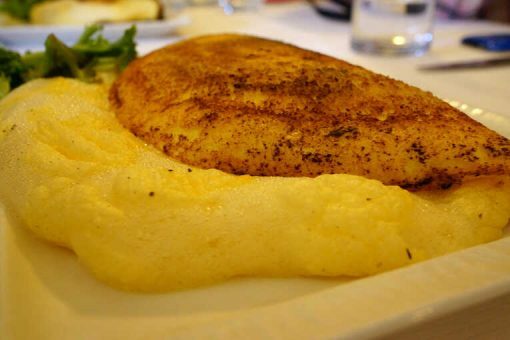 The dish was a favorite of ‘Good King Henry’ of France (or King Henri IV), who was from the Béarn region in southwestern France, not far from the Basque Country. During his reign (1589-1610), he showed concern for the poorest of his people, who could rarely afford to eat meat, other than cheap cured meats such as bacon. The Good King once famously declared: “No peasant in my kingdom should be so poor that he cannot have a poule au pot on Sunday!”. And thus the dish was christened. Where to eat it: Chez Laurette (12 Place du Foirail, 64000) in the city of Pau is a great option and will offer a very French experience. This is a very good value family restaurant, known locally as a routier. They do not speak English but you only need to point to the Poule au Pot on the menu. A specialty from the French region of Burgundy, this dish makes use of the region’s pride and joy: Burgundy wine! 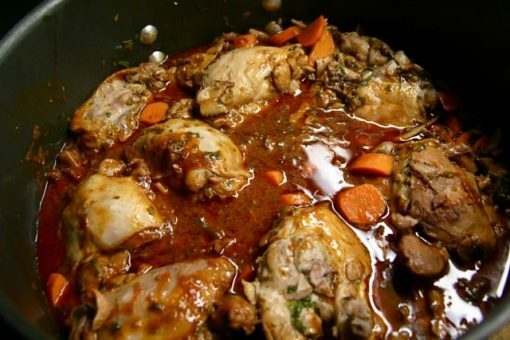 Coq au Vin has existed as a rustic dish in France for many centuries and consists of chicken (male or female) braised with wine and accompanied by bacon, mushrooms, onions, garlic, and herbs. It is often served with rice or potatoes. The Coq au Vin is best when left to marinate overnight and slow-cooked in a pan for 1-2 hours. Where to eat it: Le Cellier Volnaysien (2 Place de l’Église, 21190 Volnay). This lovely restaurant is in a vaulted cellar near the town of Beaune. 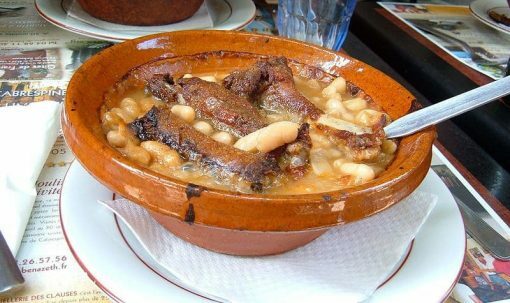 A favorite from the medieval town of Carcassonne in southern France’s Languedoc region, this rich, hearty, slow-cooked casserole contains pork, bacon, sausages, pork skin and white beans, and is served with vegetables. Historically this was a ‘peasant’s dish’, created to sustain local manual laborers through a hard day’s work. It is delicious served with a Languedoc-Roussillon red wine. Where to eat it: Comte Roger (14 Rue Saint-Louis, 11000) in the medieval city of Carcassonne. Baba au Rhum, or Rum Baba in English, is a small cake made from yeast dough and currants. 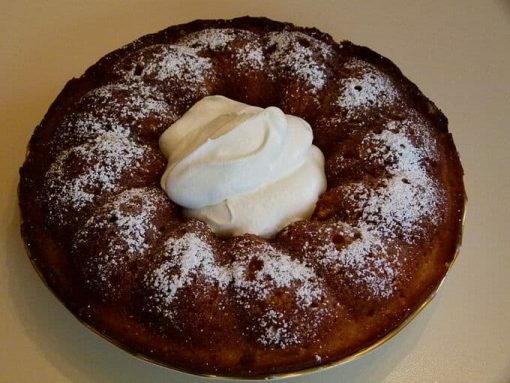 It is baked in a cylindrical mold, similar to a Bundt cake, and then soaked with rum-flavored sugar syrup and sometimes filled with cream. The Baba au Rhum is most associated with Bordeaux and dates back to the days of the slave trade when rum was brought back from the colonies on slave ships to Bordeaux and Nantes, France’s principal slave ports. Another legend has it that the cake was introduced to France in the 18th century by the exiled King of Poland, Stanislaus I. After a long journey, Stanilaus found that his sweetbread had dried up, so he dipped it in rum to moisten it. Apparently, he was delighted and named it after Ali Baba, a character from the book A Thousand and One Nights, which he was reading at the time. Where to eat it: Café du Port (1 Quai Deschamps, 33100 Bordeaux). This is an absolutely MUST-try in Bordeaux. One baba will be enough for two people. Order it at the beginning of the meal so that it will be ready by the time the main course is over. It is not recommended to drive too soon after the dessert. 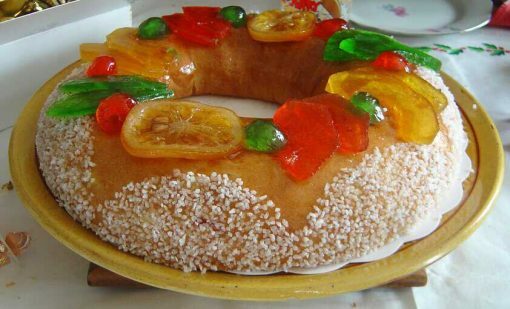 The Galette des Rois (the Kings’ cake) is traditionally eaten on January 6th (epiphany) to celebrate the arrival of the Three Wise Men in Bethlehem. It is also a popular dessert at the Mardi Gras festival in New Orleans. It is made from puff pastry and often filled with frangipane, chocolate, or fruits. In Provence, a region in the south of France, the Galette is traditionally made in the form of a ringed bun, like a large donut, scented with orange blossom and covered with large sugar granules and candied fruits. Where to eat it: Patisserie Béchard (12 Cours Mirabeau, 13100) in the beautiful city of Aix-en-Provence. In 1910, one of the organizers of the Paris-Brest bicycle race (which still exists today) requested that a special dessert be created to serve at the finish line. Pastry chef Louis Durand’s creation, a cake which resembles a bicycle wheel, has since become a famous French dessert. It is made from two choux pastry circles filled with a praline buttercream and can be found on the menu in many Parisian cafés. Where to eat it: La Patisserie des Rêves (93 Rue du Bac, 75007) in Paris. 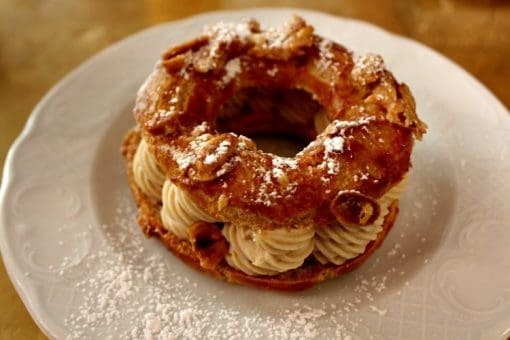 At the ‘Bakery of Dreams’, the Paris-Brest cake might be described as a ‘dream come true’. 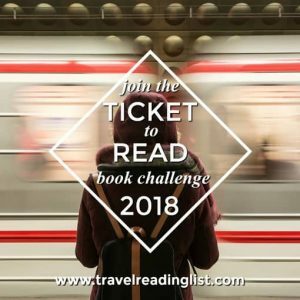 Author Bio: This post was written by Émilie Thyebaut who runs France Just For You, a small family tour company based out of the Loire Valley specializing in sending travelers to France’s loveliest hidden gems. They organize self-drive tours which are specially tailored to travelers’ preferences and include a unique 250-500 page guidebook. 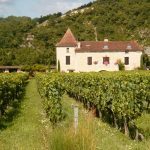 Here Emilie lists her top 10 French regional dishes and where to find them.